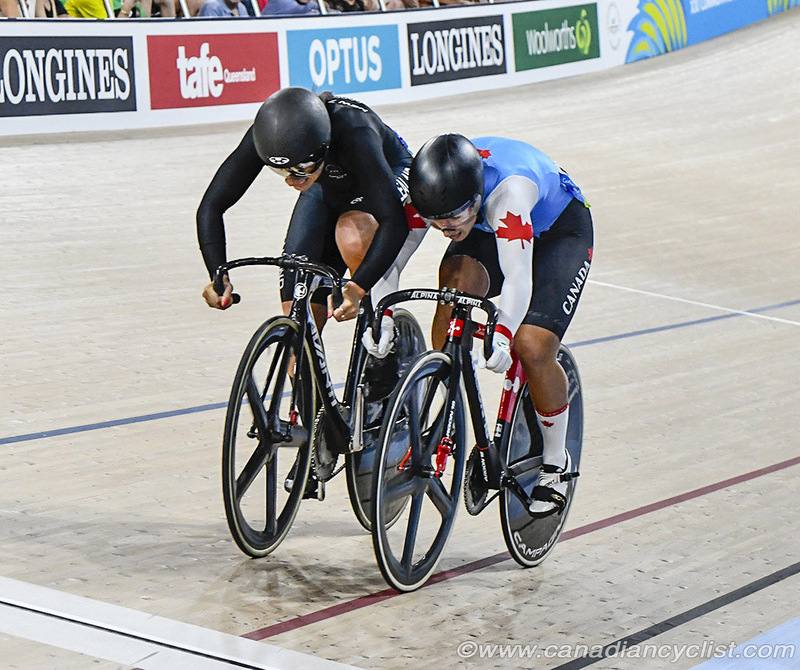 Canada could not match its two medals from the first day of competition on the track at the Commonwealth Games, in Gold Coast, Australia, however, it came very close to a bronze medal with women's sprint revelation Lauriane Genest of Levis, Quebec, who finished fourth. Genest, who was an alternate that was added to the team less than two months ago, is competing in her first international competition, but she broke the Commonwealth Games record in qualifying, with a time that stood up until the very last rider - defending champion Stephanie Morton - surpassed it. Her time of 10.757 seconds is a new Canadian record, and less than four-tenths of a second off the world record. Genest came within centimetres of making the gold medal final against eventual champion Morton, but was beaten in the semi-final by Natasha Hansen (New Zealand), who won the silver medal. Genest went up against Australia's Kaarle MCulloch for the bronze medal, but lost in two rides to her more experienced opponent. Canada's second competitor, Amelia Walsh was knocked out in the quarter-final round. "Fourth was way more than I was expecting," said Genest, "it's pretty awesome. I broke the [200 metre] record; it was a personal best, for sure. It was two-tenths faster than what I've done in training and five-tenths faster than what I've done in competition." It was also less than four-tenths off the world record. "I didn't even think of that. I guess that's my next goal!" "Then in the semi-final it went to three rides, and that was the hardest ride of the night. It cost me a lot, I gave everything in those rides and it was so close. I have no regrets; I couldn't go faster at that moment." "I've been learning from my past races, and Franck [Durivaux, national coach] is telling me that the big thing in the sprint is that when you decide to go, you have to go all out and not doubt for a second. Every time, I just go and do my sprint; I looked forward and I didn't look back. It paid off." "I was so close to the final for the gold, but I learned so much today; it's really encouraging for what's coming. I don't think I really realize right now what is happening. When I finished my last sprint, Anna Meares came to talk to me, and I didn't know it was a big deal. It's great, now they know me, that I can go fast, and they'll be more careful!" 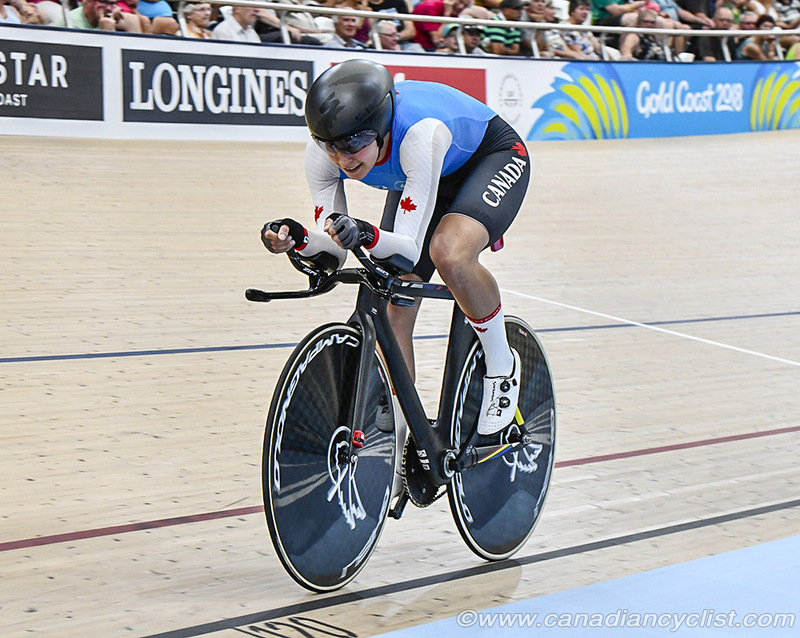 Canada also had a pair of seventh places finishes from Annie Foreman-Mackey of Kingston, Ontario, in the women's individual pursuit, and Hugo Barrette of Iles de la Madeleine, Quebec, in the men's Keirin. "My legs were definitely feeling yesterday's races," said Foreman-Mackey. "I tried to put together a solid ride and it was a PB [Personal Best] for me, which was encouraging. I mis-paced my ride, so I didn't get quite what I was going for, but I keep learning every race." Barrette had to go through the Repechage to make the second round of the Keirin, but came up short making the medal final. In the 7-12 final he dominated the final three laps to win. "It's not good enough; nothing short of the gold medal is good enough, particularly with the way I won [the 7-12 Final]. It was an easy ride against really good guys. I won't say I was unlucky [in the semi-final], but I have a problem with riding sixth [in line for the first three laps] and I drew that for the semi-final. It's something we can work on in the future. This race marked the last time I am going to focus on the Keirin. I want to focus on the Sprint for Tokyo; if we work on the individual sprint I really think we can win the biggest races. I don't like that in the Keirin you have to rely a little bit on luck and in the Sprint you don't have to worry about that." Stefan Ritter also made the 7-12 final, finishing 11th overall, after qualifying for the second round without having to go through the Repechages. "I'm definitely happy to make it through to the final round, even though it wasn't the final I was hoping for. My first ride was definitely my best one, I didn't make any tactical areas, although I rubbed shoulders with [eventual champion Matt] Glaetzer [of Australia] and had to take my foot off the gas. I was able to claw my way back to second to go on to the second round and not go through the repechage. In the semis my legs were feeling good, but I didn't leave a big enough gap when [Ryan] Owens [of England] came over the top, so I got caught on the wrong side of Owens when everyone rushed behind me and boxed myself in unintentionally. My shoulder's about as good as a broken collarbone gets; the medical team here with Canada has been great, and we are taping it up, so it's very rideable." 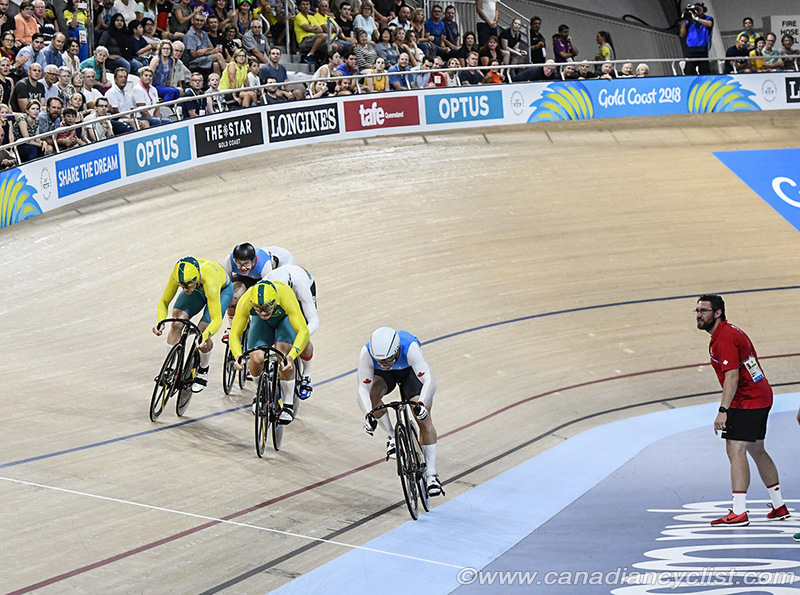 Canada also competed in the men's individual pursuit, with Adam Jamieson of Barrie, Ontario, the top Canadian finisher in 15th place. 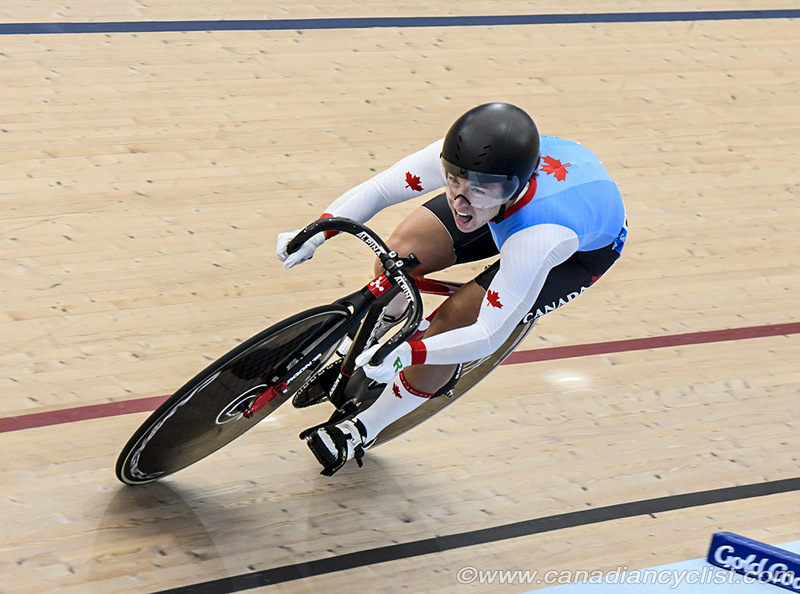 Jay Lamoureux also competed for Canada in the men's individual pursuit, finishing 18th. "Today it wasn't exactly how I wanted to go, but not every race always does. Adam [Jamieson] had a really good ride today, and we are all pleased about that. I didn't set a personal best today, but it's been a long season and this coming to the end of it and I'm pretty tired. But I gave a good go of it and everything I had." Kris Westwood, Team Manager for Cycling at the Games, said "Lauriane was a bit of a surprise, since we haven't had a chance to see her race at this level before. We knew she was fast, but to break the Commonwealth record and then to advance all the way to the bronze medal final of the Sprint is pretty amazing. You could tell by the end of the evening she was pretty exhausted, but she was still giving it her all. I think there is a lot of promise among our riders, and we are not very far from being able to regularly land on the podium."